Greenhouse 330 fan units target the small-space indoor applications that either requires; high industrial dependability and or high humidity levels up to and exceeding 100% RH (relative humidity). The nozzle-free fans can atomize ordinary water supplies into a very fine mist-like fog. Utilizing high-speed centrifugal force and powerful air flow, these units can propel a misty-fog stream up to 20 feet away. Used in small-scale commercial/Industrial applications to humidify air spaces. The smallest of the TurboXE fogging fans; Greenhouse Fogger TurboXE - 330 is designed for the smallest spaces that need the high dependability in environments up to 100% RH, industrial quality and fogging capability of the Aquafog line. Well suited for areas between 16 to 30 feet in length, this model has a maximum fogging output of 5 GPH and can propel fog up to 20 feet. Unlike the larger four-bladed units, the XE-330 utilizes a two-blade fan, making it about 30% quieter than the XE-1000. ****XE-330 comes with a 1/2HP motor and a reduced CFM fan blade assembly. ****XE-330 Fans are standard equipped with a dark green housing and a dual voltage, white epoxy painted wash-down-duty™ (WDD) motor 115/230V, 1ph, 60Hz. 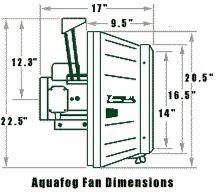 Aquafog units produce small particles averaging 25 microns in size and feature flow control for adjustment of the amount of liquid being fed to the fogging fan. At rates near full capacity, 95% of the particles produced are small enough to stay airborne. Weight w/ Wash Down Motor 40lbs.